Images from the famous scene (�? ?The Odessa stairs�?�) from the silent film Battleship Potemkin by Soviet director Sergei Eisenstein (1925) showing the events which anticipated the October revolution are confronted with sounds taken from video clips shared on YouTube by participants in the events in Odessa, Ukraine, in April 2014. 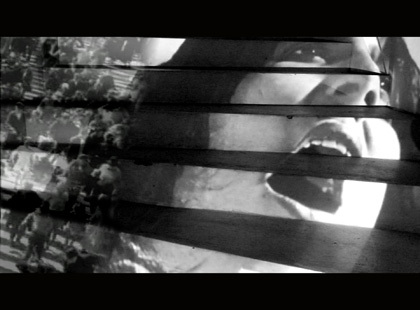 While the film images are projected on an actual staircase, the actual sounds from the Odessa events are merged with the film image. Was Karl Marx right when he stated that �?�History repeats itself, first as tragedy, then as farce"?